Featuring DisplayLink's DL-165 USB 2.0 graphics chipset, the USB-HDMIenables multiple monitors with any laptop or desktop (one adapter required permonitor, up to six on Windows PCs). Get the full benefits of USB, includingplug and play connectivity, thin and flexible cabling, and ability to connectvia USB 2.0 hubs and repeaters. Multitask with a dedicated monitor for eachdocument or application. USB graphics adapters work by rendering 2D/3D with your computer's CPU and GPU,and then compressing and transmitting the pixels that change over USB. Dualcore or 2Ghz or better CPU recommended. Recommended for web and applications,not 3D gaming or motion video playback. 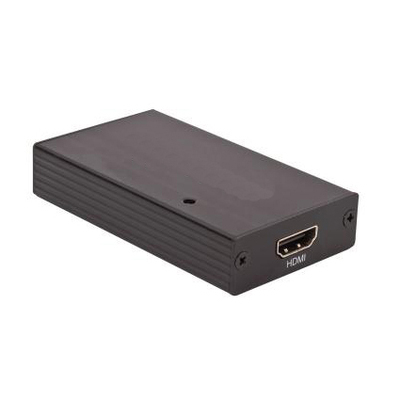 The adapter package includes the main USB 2.0 to HDMI adapter, a USB 2.0 cableand hardware adapters for the different connector types (HDMI TO DVI). Thisadapter has audio function. Supports monitors and PC-compatible TVs up1920x1080/1600x1200 Powered via USB; the adapter has an LED indicator light. Windows 7/Vista/XP drivers installed automatically via Windows Update. 32 and64 bit supported for both Vista and Win7. Vista Home Basic and Win7 StarterEdition disable multiple monitors and are not supported. Windows 8 driversavailable at DISPLAY LINKS website. GPU is used for 2D/3D rendering on Windows,requiring Intel, nVidia, or ATI primary WDDM driver. Not recommended for use onMac, as only beta-level Mac OS X 10.4+ Intel 32/64-bit driver available viadownload, and Mac has lower performance and functionality than Windows for USBgraphics. Open source available for Linux and other platforms--for advancedusers only because of manual xorg.conf editing. USB graphics devices withdifferent chipset drivers (MCT, SMSC, DisplayLink, etc.) should not be mixed onthe same system.